This is a turned Role-Playing Game based on the AD&D Greyhawk campaign setting, using the 3.5 version D&D rules. 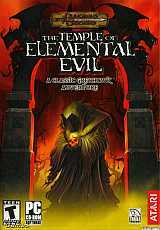 The game plot revolves the (suspected) rise of evil, originating from the Temple of Elemental Evil. In this game, players start with 5 (five) generated (or pre-generated) party members in the start of the adventure (a maximum of 8, the later 3 comprising of NPCs - Non Player Characters). Unlike most AD&D games, the maximum level cap for characters in this game is the 10th level. The party itself has an alignment (in addition to individual character alignments) which greatly affects the plot and choices the party makes throughout the game. Character alignments and the party alignment are now closely related. For example, a Lawful Good or Chaotic Evil character may not be selected within a True Neutral party alignment. Additionally, Paladins do not want to be in the same group with anyone evil. Thus, depending on the party alignment (nine default alignments to choose from), players may either take the course of being the good heroes ridding evil from the land or be the evil raiders butchering anything that moves, all of which (may it be good, bad or neutral), may effect the party reputation. The game interface in divided into 2 major area's: The overland map, where players can travel to specific locations in the land, and the default adventure interface where dialogs and combat occur. Most of the content, unique to playing an evil campaign was taken out of the game due to pressure by the publisher (Atari). An entire area with subquests (the brothel) was also removed because they were afraid to lose the T rating. Luckily, the 'Circle of Eight' fan group re-enabled the "Brothel" Map, NPC's, quest, and companion in their unofficial patches.